Dreams Are Calling. : H&M Loves Coachella. H&M dropped it's Coachella inspired line yesterday, and oh my, it's beautiful. Full of festival fringes and sunshine aestheics, this line will have wishing it was summer already. As you all know, I'm obsessed with Coachella. (See here.) The Palm Springs desert, SoCal sunshine, the good vibes it brings and of course the music. It is obviously the fashion that mainly detonates all over social media during the two weekends in April. Every post is filled with crop tops, kimonos and beautiful prints. And if, like me, you find yourself double-tapping on every instagram-worthy outfit going, well, H&M might just be the place to go. I've picked out my personal favourites above and I'm about to go spend some money on a few pieces I probably don't need. But boy, do I want. 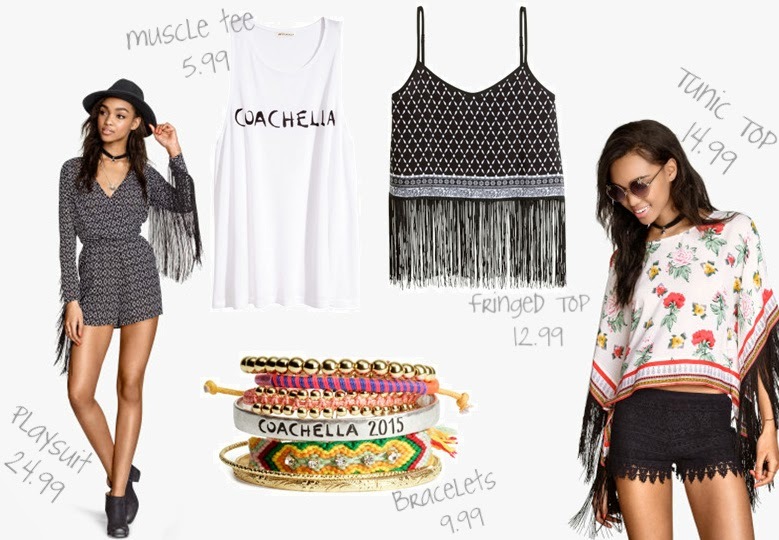 You can view everything from H&M Loves Coachella here! What's your favourite piece from the line? Listening to: Mansions On The Moon- Don't Tell. Love the Playsuit and kimono!